HONORABLE MENTION: Albany Academy 3-0, Alden 2-1, Beekmantown 2-1, Buffalo Burgard 2-1, Clarke 3-0, Dover 2-1, Edgemont 3-0, Fieldston-AIS 2-0, Geneva 3-0, Homer 2-1, Locust Valley 1-1, Malverne 2-0, Marcellus 2-1, Marlboro 2-1, Mexico 2-1, Nanuet 3-0, Oneida 2-1, Pleasantville 3-0, Ravena-Coeymans-Selkirk 2-1, Schalmont 1-2, Schuylerville 2-1, Susquehanna Valley 2-1, Valhalla 2-1, Wayne 2-1. HONORABLE MENTION: Coxsackie-Athens 2-1, Gowanda 2-1, Holy Trinity (Sec. 2) 2-1, Letchworth-Warsaw 3-0, LeRoy 2-1, Lowville 2-1, Southwestern 2-1, Stillwater 2-1, Voorheesville 2-1, Watervliet 3-0. Woodlands 1-1. HONORABLE MENTION: Binghamton Seton 2-1, Bolivar-Richburg 2-1, Delhi 3-0, Elmira Notre Dame 2-1, C.G. Finney/Northstar 3-0, Randolph 2-1, Sandy Creek 2-1, Tioga 1-2, Warrensburg/Bolton 2-1, Whitehall 3-0. 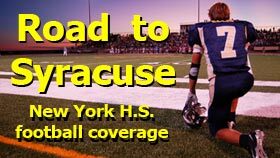 WINNING STREAKS (ALL CLASSES, 8 OR MORE WINS): Archbishop Stepinac 14, Chenango Forks 14, Sayville 14. LOSING STREAKS (ALL CLASSES, 12 OR MORE LOSSES): Fallsburg 16, Oneonta 16, Comsewogue 13, Whitney Point 14.